New York City’s Staten Island Ferry is one of the only remaining remnants of an entire ferry system that transported New Yorkers back and forth from borough to borough. Today the nine-vessel fleet provides service to 22 million people every year between Manhattan and Staten Island. The ride also provides beautiful views of New York Harbor and the Statue of Liberty/Ellis Island. With 117 daily trips, the ferry serves not just as a journey but a destination for locals and tourists alike. The origins of the ferry date back to the early 1800s. For years ferry service had been conducted between the boroughs on private two-masted sailboats called periaugers. In 1810, a young entrepreneur from Staten Island named Cornelius Vanderbilt started his own service using his own periauger, which he purchased with money from his birthday. During the War of 1812, access to New York Harbor was heavily restricted. Vanderbilt found success by carrying cargo along the river and used the profits to buy even more boats. 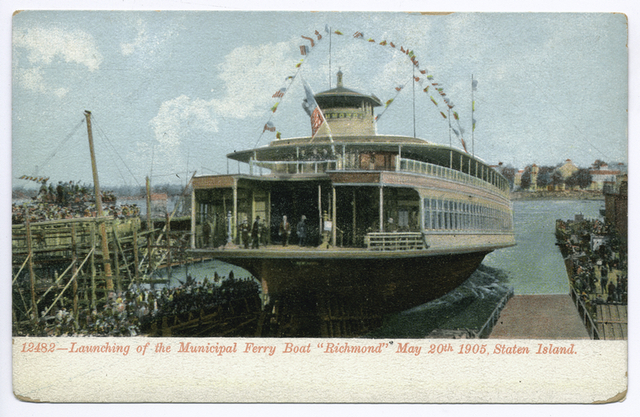 In 1817, Richmond Turnpike Company started the first motorized ferry service from Manhattan to Staten Island. That company was later owned by Vanderbilt himself until the City of New York assumed control in 1905. By that time numerous private companies had also operated ferry routes from Staten Island to both Manhattan and Brooklyn, most famously the Tompkins & Staples Ferry and the New York & Staten Island Ferry Company. All three of these companies would merge in 1853 but due to vehicular traffic increase, all routes from Brooklyn would end by the mid 1960s. On the water today, every ferry you see will be at least two levels, if not more. The first double-decked boat to operate in New York Harbor was built in 1852 by the New York & Staten Island Ferry Company. Three more were built in the following years to accommodate growing ridership. These ships were later used in the Civil War to create a blockade against the Confederate Army, all but one survived. With only one ferry back and forth between boroughs, every passenger of the Staten Island ferry will arrive or depart at St. George terminal today. But with various companies operating in the Hudson, there were various terminals to be used. That is until Canadian entrepreneur Erastus Wiman proposed combining the various ferry operations to use just one Staten Island terminal. This terminal became St. George ferry landing, opening in March of 1886. Up until the early 1900s, all ferries were operating on a railway system, which felt unsafe to the residents of Staten Island. Their fears were only made worse in 1901 when one ferryboat was struck by another, resulting in a huge hole through the middle of the boat and 4 or 5 victims. Early the next year, discussions were held throughout the city to demand ferry service improvement, which resulted in the city acquiring ownership of two major routes in early 1905. This purchase was intended to be temporary but not a single private operator could be found. Eventually, the promise became that the ferries would continue to be the easiest way to travel from island to island until a tunnel between Staten Island and Brooklyn could be completed. But this tunnel never made it past its’ first year of construction. The city continued to find alternate methods of transportation in order to connect Staten Island with the rest of New York- bridges, tunnels, etc. The most notable of these methods being the Verrazano-Narrows Bridge. This led to a decline in patronage and fare revenues, and the eventual discontinuation of various ferry services in the area. By 1967, almost all ferries in NYC had closed due to the competition from automobile traffic. The only line that continued to thrive was the ferry from St. George, Staten Island to Whitehall, Manhattan as it provided the most direct link between the two boroughs. Commuter ridership was also expected to increase due to an expected influx of residents to Staten Island after the Verrazano’s opening. However, by the late 1980s, ferries started to once again grow in popularity. One in particular, known as the Fast Ferry, travelled at top speeds from St. George to East 34th Street in Midtown Manhattan. Starting service in early 1997, the service provided transport to over 1,600 commuters daily. While this proved to be successful for a few months, its operation was eventually ceased after the competing Whitehall Street line eliminated its’ fare in July of that same year. As part of an MTA transfer scheme (“one-city, one-fare”) Staten Island transit riders could pay the single $1.50 fare on a Staten Island bus or train and get a free transfer to a Manhattan bus or train by taking the ferry at no additional cost, and vice versa. In response, the $5-per-ticket Midtown ferry lost extreme ridership and was unable to make a profit, going out of business by the end of 1997. The Staten Island ferry also played a crucial role after the September 11th attacks. 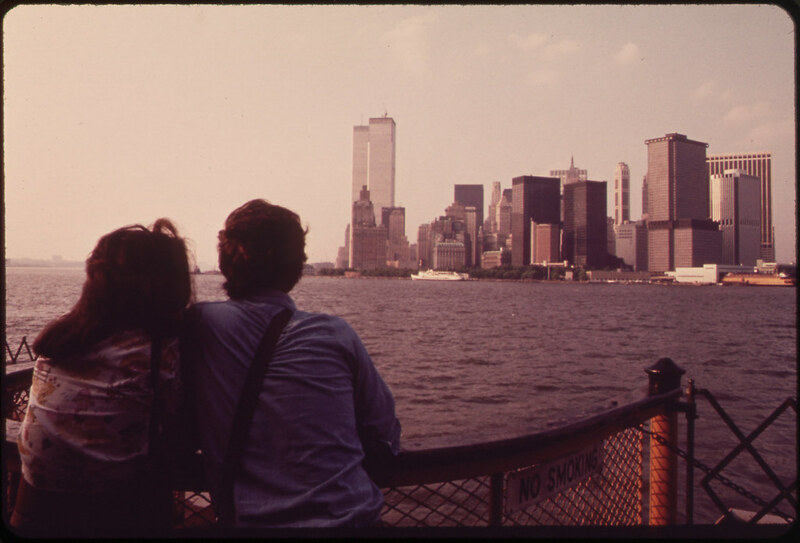 Ferryboats were used to evacuate attack victims from the World Trade Center and downtown Manhattan. Unfortunately, like most of the city, the Staten Island Ferry would never be the same following the event. After closing for a week, ferry service was restored by September 18. Many ferries ended up being diverted to Brooklyn due to the closures of subways and roads across the East River. In 2003, both of the terminals’ lower levels were closed and all vehicular traffic was banned on the ferry. While the lower levels have since reopened, they are only accessible to passengers to reduce crowding on the upper decks. Today, the Staten Island Ferry is the single busiest ferry route in the United States of America and the busiest passenger-only ferry system in the entire world. It’s importance to the city cannot be overstated. Nor can its history ever be ignored.